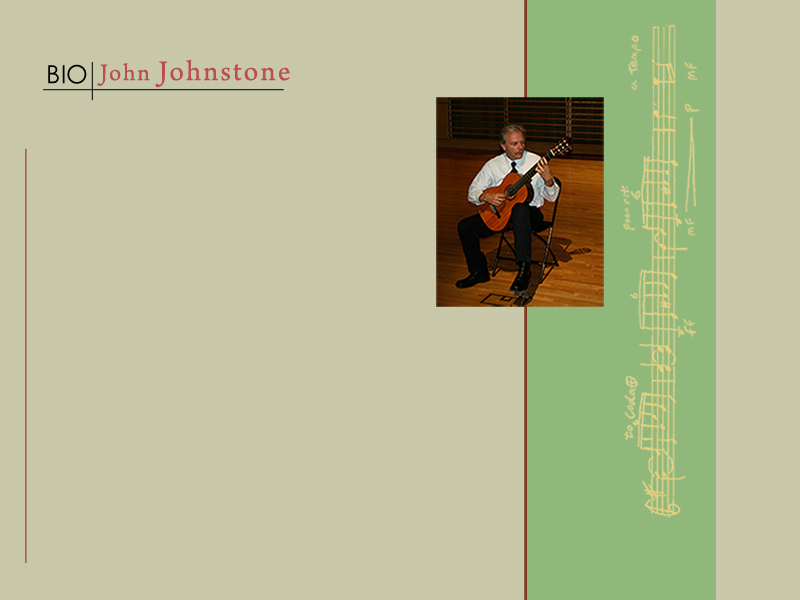 John Johnstone has been performing, composing, and teaching classical guitar since 1978. He is on the guitar faculty of Bowdoin College and Portland Conservatory of Music. He received a Bachelor of Music in Performance from the University of Southern Maine and studied guitar with David Leisner, Neil Anderson, Bob Sullivan and George Sakellariou. He has taken master classes with Manuel Barrueco, Sharon Isbin, Adam Holzman, Bruce Holzman, Nicholas Goluses, Norbert Kraft and many others. Mr. Johnstone has performed with the Portland Symphony Orchestra, the PSO Chamber Ensemble, and played an all Bach solo concert at the Maine Festival. He debuted his classical, jazz, and electronic music at the Portland Conservatory and performs in a guitar and flute duo and as a solo guitarist throughout the Northeast. On Mr. Johnstone's music page you can purchase mp3's for his guitar pieces or stream his solo guitar and flute and guitar music. From the music page you can also download free sheet music of his guitar compositions: Five Pieces (2008), Calendar Island Suite (2011), Acadia Minor (2013) Vanishing Point (2014), Dream From A Cave (2015) and Blue Lullaby (20015). His new CD, Dream From A Cave, was released April, 2018. It is a compilation of of all of Mr. Johnstone's recorded compositions, performed by the composer. The pieces have been remixed and remastered and is available at all online music services.